"This is an easy smoky salsa that can be adjusted to any degree of heat that you like by increasing or decreasing the jalapenos!" Rub tomatoes with oil and grill for 10 minutes, turn. Place poblano, Anaheim, jalapeno chiles, and the green pepper on the grill. Grill 5 to 7 minutes per side, being careful not to let them burn. The skins should blister and brown. Remove tomatoes to a separate bowl. Place the chiles and pepper in an airtight container to let them steam while they cool so they're easier to peel. Peel tomatoes and drain excess liquid. Peel and seed peppers. Place the tomatoes, chiles, green pepper, cilantro, vinegar, onion, garlic, and salt in the container of a food processor. Pulse 4 or 5 times. Add liquid smoke and more jalapenos if desired. 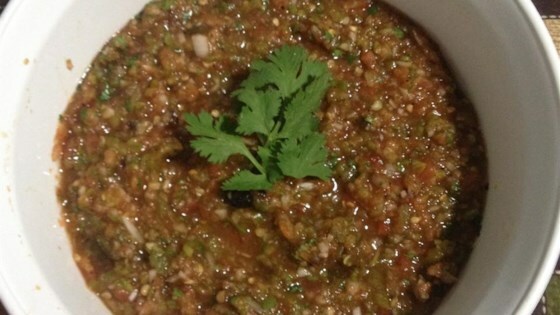 Pulse until salsa is as chunky or smooth as you like. I made this for a school project with homegrown chiles and tomatoes. We only had bell peppers and jalapenos and dried cilantro but it turned out great. this is very good, even better when refrigerated for a day or two. it is a lot of work for a salsa, though. I have made this twice, both with different types of hot peppers and omitting the liquid smoke...both batches turned out great! Great recipe. I added seranos. Wonderful. Best salsa I've every made. I will be roasting my chili's and tomatoes all the time for salsa. Yummy!